I opened a bag of M&M’s and there came out a bunch of different colored M&M’s. I picked the red colored one and then the green, trying to figure out if different colored candies taste different also. And I kept going on and choose another color and so on, until I realized the whole bag of candies had vanished. I knew that all the M&M candies taste the same and its just the color which varies but that’s what I remember, I enjoyed doing as a kid, Today, as a mother of two kids and being aware of all the artificial dyes used in the candies, I prefer using them for experiments with my kids. Continuing with our Candy science experiment, today we would try to learn the science of Chromatography – separating parts of a mixture by using an absorbent material. Infact, have you ever wondered what different dyes are used to make a particular colored M&M. Which colored dyes separate into other colors ? Which candy dyes remain the same ? 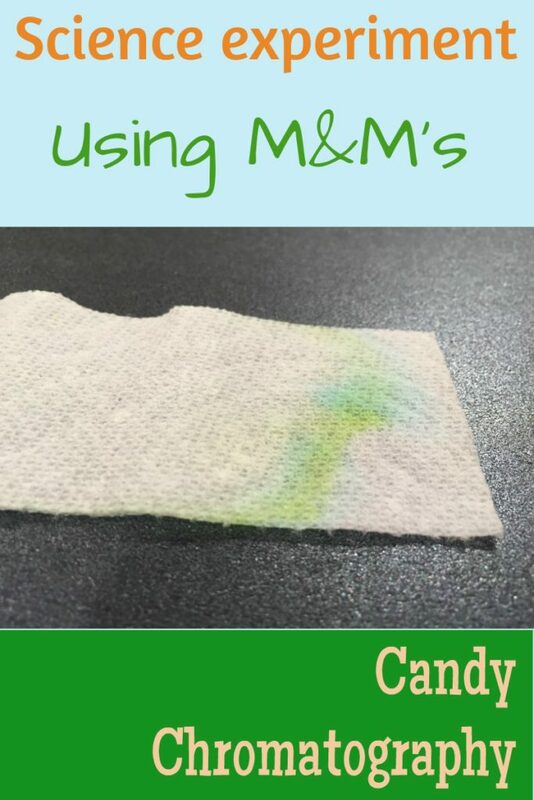 We would be using a green M&M to do this experiment. Cut the paper towel into strips about an inch wide. Place one end of the strip in the center of the saucer and place the green M&M on top of the paper strip end. 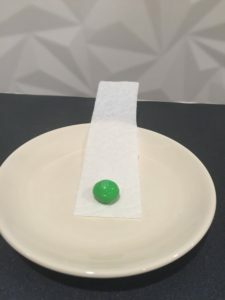 Place few drops of water on the green M&M. 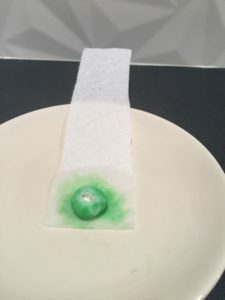 After few minutes, turn the candy over so more color bleeds into the water and eventually to the paper towel strip, making sure lot of green dye has been transferred to the paper towel strip. Place the skewer on top of the glass filled with water. Carefully put the pigmented end of the strip over the skewer into the glass until the strip just touches the water. Make sure that the strip is not touching the glass sides. Let the water rise up the strip until it reaches few inches from the top ( it might take few minutes ). Remove the strip from the glass of water. If the water reaches the top of the strip, it might distort your results. Let the paper strip dry out completely and watch the colors in the green dye crawl up the paper strips and separate. 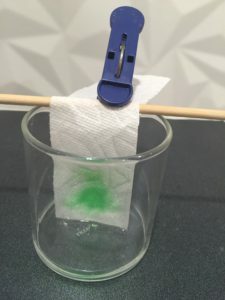 As the water is soaked up by the filter paper, it carries the color in the green dye with it. 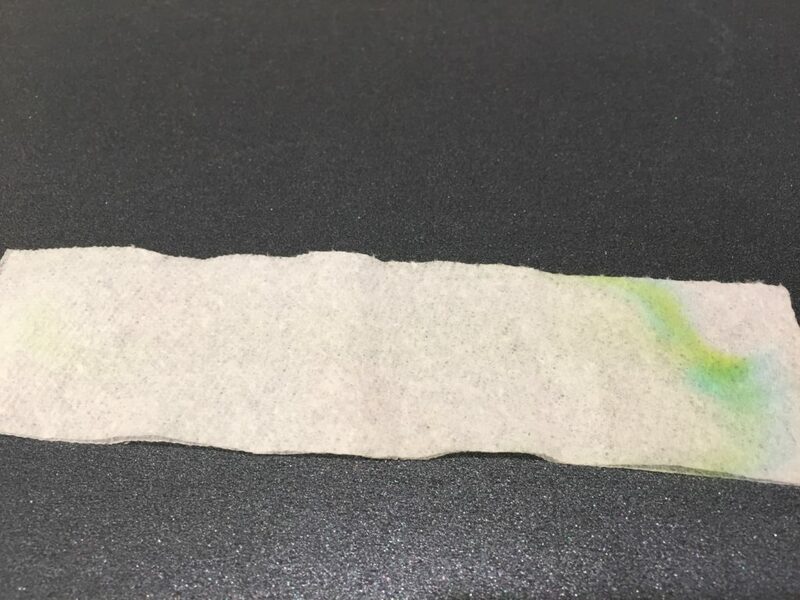 The different blue and yellow pigments in the green dye would travel through the paper at different speed and would slowly separate, making a colorful pattern of blue and yellow. I wonder which particular colorful candy contains all the colors of the rainbow ? Any guesses, may be a candy with a black dye ! While we try to figure it out, Happy experimenting !